Artist's view of exoplanet orbiting the star HD 189733. 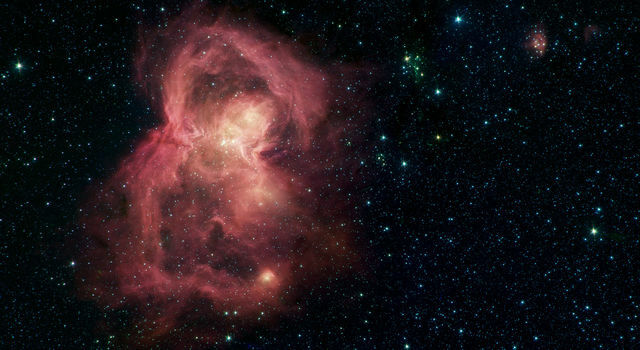 Image credit: ESA, NASA, M. Kornmesser (ESA/Hubble), and STScl. PASADENA, Calif. -- NASA's Hubble Space Telescope has discovered carbon dioxide in the atmosphere of a planet orbiting another star. This breakthrough is an important step toward finding chemical biotracers of extraterrestrial life. 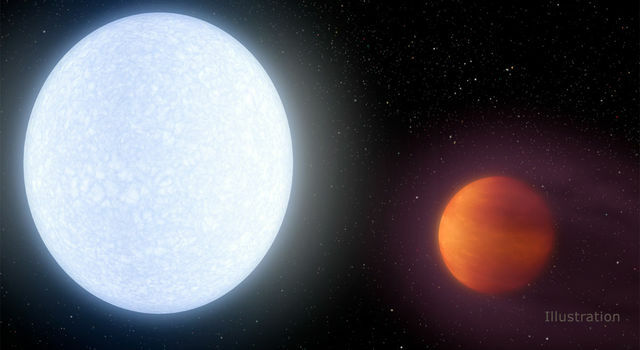 The Jupiter-sized planet, called HD 189733b, is too hot for life. But the Hubble observations are a proof-of-concept demonstration that the basic chemistry for life can be measured on planets orbiting other stars. Organic compounds also can be a by-product of life processes, and their detection on an Earthlike planet someday may provide the first evidence of life beyond our planet. Previous observations of HD 189733b by Hubble and NASA's Spitzer Space Telescope found water vapor. Earlier this year, Hubble found methane in the planet's atmosphere. 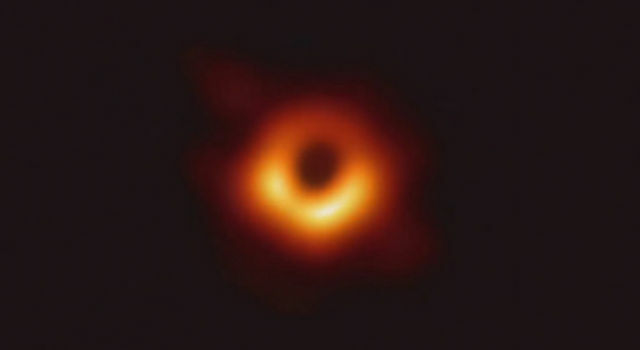 "Hubble was conceived primarily for observations of the distant universe, yet it is opening a new era of astrophysics and comparative planetary science," said Eric Smith, Hubble Space Telescope program scientist at NASA Headquarters in Washington. "These atmospheric studies will begin to determine the compositions and chemical processes operating on distant worlds orbiting other stars. The future for this newly opened frontier of science is extremely promising as we expect to discover many more molecules in exoplanet atmospheres." Mark Swain, a research scientist at NASA's Jet Propulsion Laboratory in Pasadena, Calif., used Hubble's near-infrared camera and multi-object spectrometer to study infrared light emitted from the planet, which lies 63 light-years away. Gases in the planet's atmosphere absorb certain wavelengths of light from the planet's hot glowing interior. Swain identified carbon dioxide and carbon monoxide. The molecules leave a unique spectral fingerprint on the radiation from the planet that reaches Earth. This is the first time a near-infrared emission spectrum has been obtained for an exoplanet. "The carbon dioxide is the main reason for the excitement because, under the right circumstances, it could have a connection to biological activity as it does on Earth," Swain said. "The very fact we are able to detect it and estimate its abundance is significant for the long-term effort of characterizing planets to find out what they are made of and if they could be a possible host for life." This type of observation is best done on planets with orbits tilted edge-on to Earth. They routinely pass in front of and then behind their parent stars, phenomena known as eclipses. The planet HD 189733b passes behind its companion star once every 2.2 days. The eclipses allow an opportunity to subtract the light of the star alone, when the planet is blocked, from that of the star and planet together prior to eclipse. That isolates the emission of the planet and makes possible a chemical analysis of its atmosphere. "In this way, we are using the eclipse of the planet behind the star to probe the planet's day side, which contains the hottest portions of its atmosphere," said team member Guatam Vasisht of JPL. "We are starting to find the molecules and to figure out how many there are to see the changes between the day side and the night side." This successful demonstration of looking at near-infrared light emitted from a planet is very encouraging for astronomers planning to use NASA's James Webb Space Telescope after it is launched in 2013. These biomarkers are best seen at near-infrared wavelengths. Astronomers look forward to using the Webb telescope to look spectroscopically for biomarkers on a terrestrial planet the size of Earth or a "super-Earth" several times our planet's mass. "The Webb telescope should be able to make much more sensitive measurements of these primary and secondary eclipse events," Swain said. 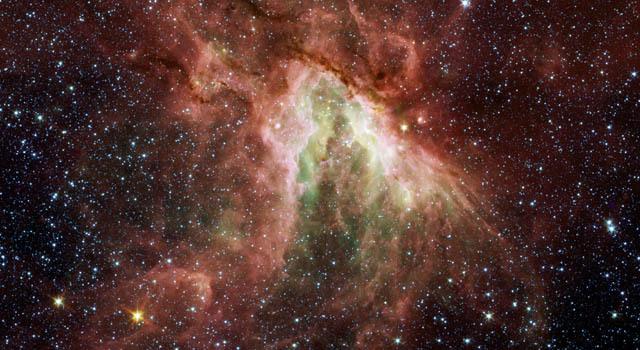 More information about the Hubble space telescope is at http://www.nasa.gov/hubble .